Good quality water is the foundation of all soilless growing, however not everyone is blessed with a suitable water source for hydroponics. Even crystal clear water may contain a range of minerals, water treatment chemicals and pathogens which can damage plants and slow growth. Luckily, water is relatively easy to treat and some growers choose to install small reverse osmosis (RO) units just to ensure their water is always top quality. Water can be sourced from wells, or collected from roofs, streams, rivers or dams, but many growers are reliant on municipal or city water supplies and while these are usually safe to drink, they can sometimes pose problems for plant growth. The main quality problems encountered with different water types are as follows. Some water sources can carry plant disease pathogens such as Pythium which cause root browning and death if they take hold of a weakened plant. Ground water sourced from rivers, streams or stored in dams/reservoirs typically poses the most problems for soilless growers, particularly if the water is not treated before use. Water which is continually exposed to air and soil becomes contaminated with organic matter, minerals leach from the surrounding area, and pathogen spore loading can be high. Many greenhouse operations use open air storage dams as an economic method of storingholding large volumes of water collected from greenhouse roofs or other surfaces, however this water is typically filtered and treated before use. River or stream water often has inconsistent water quality as operations being carried out up stream affect composition of the water and rainfall and flow rates also fluctuate throughout the year. Water from wells in different locations around the world can vary considerably in quality. Very deep wells passing through certain soil layers will give an almost `filtered water’ although some minerals are always likely to be present in ground water. Some wells, particularly older types, or those which have been poorly maintained and are shallow can present problems with contamination from pathogens, nematodes and agrichemicals leached through the upper soil layers into the well water2. Well water may be `hard’ and contain levels of dissolved minerals such as calcium and magnesium and other elements depending on the soil type surrounding the well. 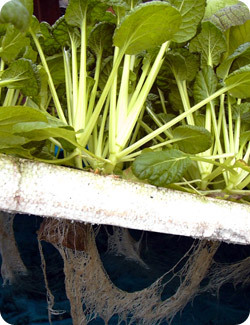 High levels of sodium and trace elements are the most problematic for hydroponic growers, levels in excess of 2000ppm sodium have been found in inland well waters in some arid regions, although most well waters don’t pose such an extreme problem. Sodium is not taken up by plants to any large extent, hence accumulates in recirculating systems, displacing other elements. Trace elements in ground water, such as copper, boron and zinc may sometimes occur at high levels. Soilless growers utilizing well water are advised to have a complete analysis carried out on their water source to determine if any potential problems exist. Rain water is generally low in minerals, however acid rain from industrial areas, sodium from coastal sites and high pathogen spore loads from agricultural areas do still occur3. Much of this contamination has been found to happen when rain water falls on roof surfaces and picks up the organic matter, dust and pollutants which naturally collect there. In fact, numerous studies have shown that due to contamination following contact with catchments surfaces, stored rainwater often fails to meet the WHO guideline standards for drinking water especially with respect to microbial contamination3. In the USA, rainwater collected within 48km of urban centres is not recommended for drinking due to atmospheric pollution3. While drinking water standards don’t necessarily apply to hydroponic growing, the fact that high levels of microbial contamination often occur in stored rainwater means that common plant pathogen spores are also likely to be present. Rain water is best collected from clean surfaces with a ‘first flush’ device installed. which allows the first few minutes of rainfall to be discharged from the roof before any is collected for use. Rain water may also contain traces of zinc and lead5 from galvanized roof surfaces or where lead flashings and paint may have been used4 and is a greater problem when the pH of the rain water is low. Generally, rain water collected from greenhouse roofs is free of zinc and lead problems. ‘Hard’ and ‘soft’ are terms used to describe the quality of many water sources. 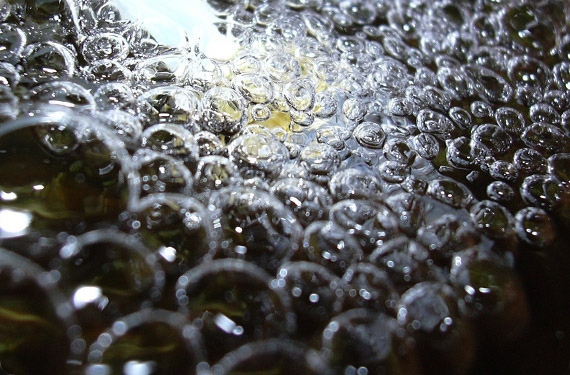 Hard water has a high mineral content, usually originating from magnesium, calcium carbonate, bicarbonate or calcium sulphate, which can cause hard, white lime scale to form on surfaces and growing equipment. Hard water may also have a high alkalinity and a high pH, meaning that considerably more acid is required to lower the pH in the hydroponic system to ideal levels. While hard water sources do contain useful minerals (Ca and Mg), these can upset the balance of the nutrient solution and make other ions less available for plant uptake. Smaller growers can counteract this by making use of one of the many ‘hard water’ nutrient products on the market. Soft water, by comparison, is a low mineral water source. Often rainwater is ‘soft’, while municipal water sources across the country range from very hard to soft, depending on where the individual city water supply is taken from. Some growers prefer to start with water which has been pre-treated to remove any chemicals, pathogens and other contaminates. RO (reverse osmosis), distilled water, filtered and bottled water are all options for small growing systems and those concerned with water quality. Many city water sources are perfectly acceptable for soilless growers and hydroponic systems and can be used with no adjustment or treatment. However, the water treatment options used by city water suppliers change over time and with advancing technology. In the past, the main concern was chlorine in city water supplies. Chlorine is a disinfection agent which destroys bacteria and human pathogens, and residual chlorine can be detected by smell in a water source. High levels of chlorine can be toxic to sensitive plants, however chlorine dissipates rapidly into the air and can easily be removed by aerating the water or just letting the water sit or age for a few days before use. While the chlorination of water supplies was easy to deal with, nowadays, city water treatment plants are moving more towards the use of other methods of treating drinking water. It has been found that some human pathogens were resistant to the action of chlorine, and consequently drinking water regulations were changed and alternative disinfection methods are being used more frequently. These days, water may still be chlorinated, but an increasing number of city water supplies have switched to use of ozone, UV light, chloramines, and chlorine dioxide. While many of these methods present no problem for hydroponics and soilless growers, the use of chloramines and other chemicals by many city water treatment plants can pose a problem for plants where high levels are regularly dosed into water supplies. Chloramines are much more persistent than chlorine and take a lot longer to dissipate from treated water, hence they can build up in hydroponic systems and cause plant damage. 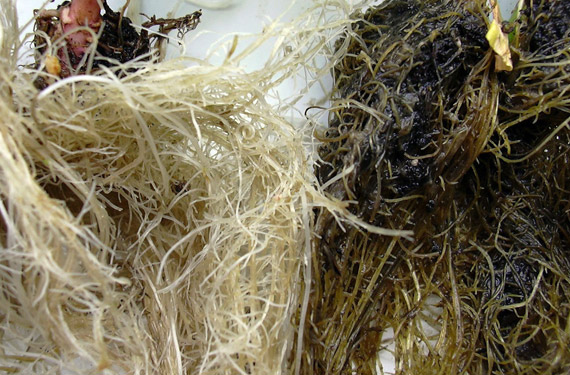 Damage to plants caused by chloramines in city water supplies is also very difficult to diagnose as it looks similar to the damage caused by many root rot pathogens and growers are often unaware of what is causing the problem. Some plants are also naturally much more sensitive to chloramines than others, so determining levels of toxicity has also been difficult. 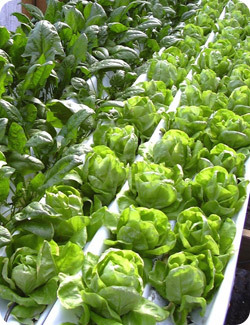 One hydroponic research study has estimated that the critical level of chloramines at which lettuce plant growth was significantly inhibited was 0.18 mg Cl/g root fresh weight1. Hydroponic growers who have concerns about the use of chloramines in their city water supply can treat the water with specifically designed activated carbon filters or by using a dechloraminating chemical or water conditioners which are sold by the aquarium trade to treat the water for fish tanks. The chloramine carbon filters must be of the correct type that has a high quality granular activated carbon that allows for the long contact time required for chloramine removal. Growing systems that utilize substrates such as coco are a safer option than soilless culture or recirculating systems where water treatment chemicals are suspected to be a problem. Natural substrates provide a ‘buffering’ capacity in a similar way to soil and can deactivate some of the treatment chemicals contained in the water supply. Other common water quality problems include the use of ‘water softener’ chemical either by city treatment plants, or in the home – these are often sodium salts which result in problematic sodium levels in the hydroponic nutrient. If sodium levels are too high, either through use of water softener chemicals or naturally occurring in the water supply, RO is the best option for sodium sensitive crops. How do you know if you have a water quality problem? It can be very difficult to determine if a water quality issue is responsible for any plant growth problems which might be occurring. Many diseases and errors with nutrient management or incorrect environmental conditions will produce symptoms very similar to common water quality problems. Ideally, obtaining a full water analysis is useful for most growers, however detecting other issues such as chemical or microbial contamination is more complex. 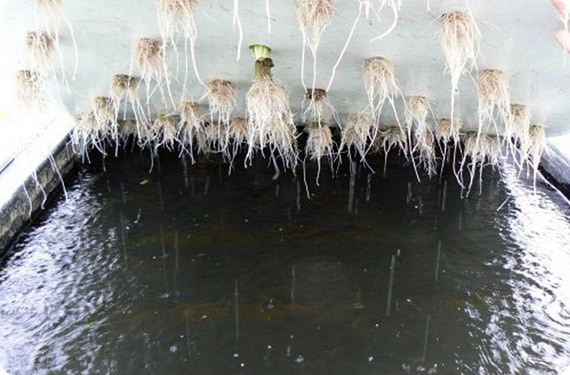 The simplest method of determining if water quality is the cause of growth problems is to run a seedling trial – growing sensitive seedlings such as lettuce using RO or distilled water as the ‘control’ or comparison will usually show up any problems originating from the water supply. Keeping all other factors such as nutrients, temperature and light the same between the plants in the different water samples and using a solution culture system will give the most accurate test. Comparing growth in the pure water to the suspected water sample will reveal any problems (if growth problems appear in both seedling treatment water samples, then something other than water quality is to blame). Water quality problems may show as stunted roots which don’t expand downwards, short, brown roots, yellowing of the new leaves, stunted foliage growth, sunken brown spots on the foliage, leaf burn and even plant death. Zoosporic pathogenic fungi such as Pythium and bacteria can survive in and be distributed by water6. Water sources which may not have been treated and may contain disease pathogens such as ground, river or steam water can be relatively easily cleaned up by the grower before use. The safest options are UV, ozone and slow sand filtration as these won’t leave chemical residues which may harm young, sensitive root systems. Small UV treatment and filtration systems such as those used in fish ponds and aquariums are suitable for treating water for hydroponic use and will kill plant pathogens and algae. However these are best used for treating water only, not nutrient solutions as UV can make some nutrients unavailable for plant uptake. Even clean, clear water may contain a range of minerals, water treatment chemical and pathogens which can damage plant growth. Activated charcoal (slow) filters are still one of the more reliable and inexpensive ways of removing suspected contaminates from a water supply. Herbicides, pesticides, chlorine, chloramines, and other chemicals are reduced to low levels by suitable activated charcoal filters and these can be used by small and large growers alike. If chlorine alone is a problem, aerating the water for 48 hours by using a small air pump will dissipate this chemical. Using substrate-based systems incorporating a media such as coco fibre will give a greater degree of protection and ‘buffering’ capacity where chemical contaminates are suspected. Aeration of chlorinated water supplies will cause the chlorine to dissipate, making the water safe to use in hydroponic systems. Often it is possible to dilute a water supply which may have a slight excess in certain minerals, particularly trace elements, with a higher quality water source, however for water sources with a high natural salinity reverse osmosis or distillation are the only methods of demineralization. Some crops such as tomatoes are far more tolerant of excess minerals and salinity than others such as lettuce, so this factor should be taken into account. Hard water is best treated with acid to lower the pH to 6.5 before adding any nutrients to make up the nutrient solution or before using the water to top up a nutrient reservoir. This will reduce the total amount of acid required in the system to keep pH under control. Hard water also contains minerals such as calcium and magnesium, so using a specific ‘hard water’ nutrient formulation or product in recirculating systems (like CANNA Substra Hard Water) is advised, since these will keep nutrient ratios more in balance and also assist with keeping pH in check. Date S, Terabayashi S, Kobayashi Y, Fujime Y., 2005. Effects of chloramines concentration in nutrient solution and exposure time on plant growth in hydroponically cultured lettuce. Scientia Horticulturae Volume 103(3) pp 257-265. Richards et al., 1996. Well water quality, well vulnerability and agricultural contamination in the Midwestern United states. Journal of Environmental Quality Volume 25 pp389-402. Gould J., 1999. Is rainwater safe to drink? A review of recent findings. Anais da 9 Conferencia Internacional sobre Sistemas de Captacao de Agua de Chuva, Petrolina, PE, 06-09 De Julho de 1999. Yaziz MI et al., 2003. Variations in rainwater quality from roof catchments. Water Research Volume 23 issue 6, 761-765. Zhou T and Paulitz TC., 1993. In vitro and in vivo effects of Pseudomonas spp. On Pythium aphanidermatum: Zoospore behaviour in exudates and on rhizoplane of bacteria-treated cucumber roots. Phytopathology Volume 83, no.8 pp 872-876.